My family went on a road trip for the first week and a half of August. We started our trip in San Francisco, visited Yosemite, rode through Death Valley, stopped at two national parks in Utah, and explored the Grand Canyon. We drove the long distance in our RV, a huge tan vehicle with brown and black stripes. 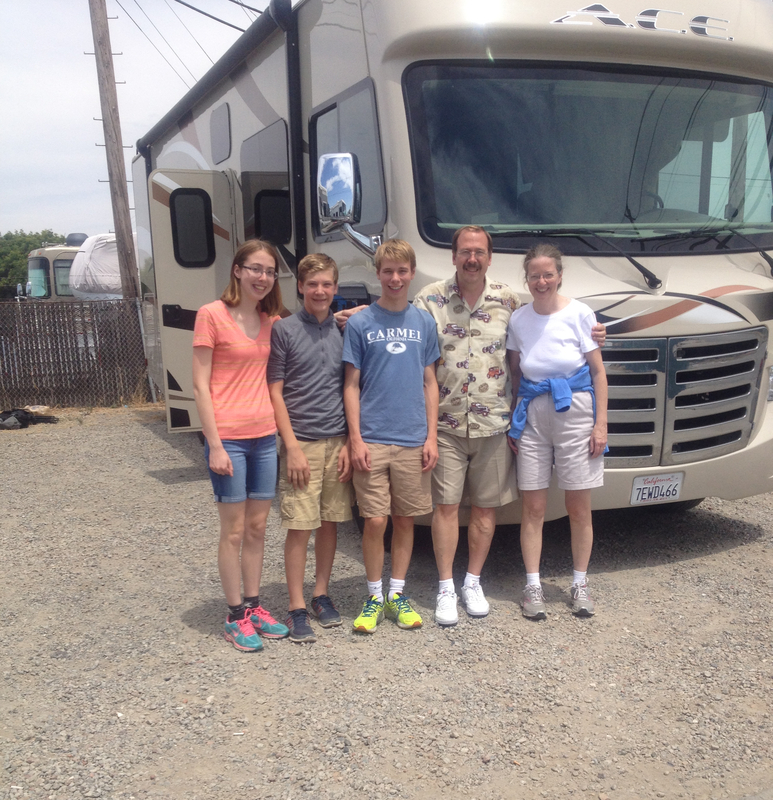 My family meets our RV at San Francisco Bay Area Private RVs. There were many memorable days in our trip, but Sunday, August 10 was one that I won’t forget. On this particular Sunday, my family went mule riding. We had stayed the night before at El Tovar, a charming National Park lodge on the South Rim of the Grand Canyon. We ate breakfast at El Tovar, and then walked to Bright Angel Lodge, a nearby hotel where people prepared for the mule rides. We talked to an employee at the check-in desk for the mule rides, and she told us that we needed to wear long-sleeved shirts on the ride. We decided to buy Grand Canyon t-shirts at the Bright Angel Lodge gift shop. The employee at the check-in desk also told us that our glasses and hats must have strings around them to prevent them from falling off of our heads. We bought cheap cowboy hats from the employee, and my mom, dad and I attached strings to the sides of our glasses. Bedecked in long-sleeved clothing and stringed accessories, we rode a bus to the mule stables. 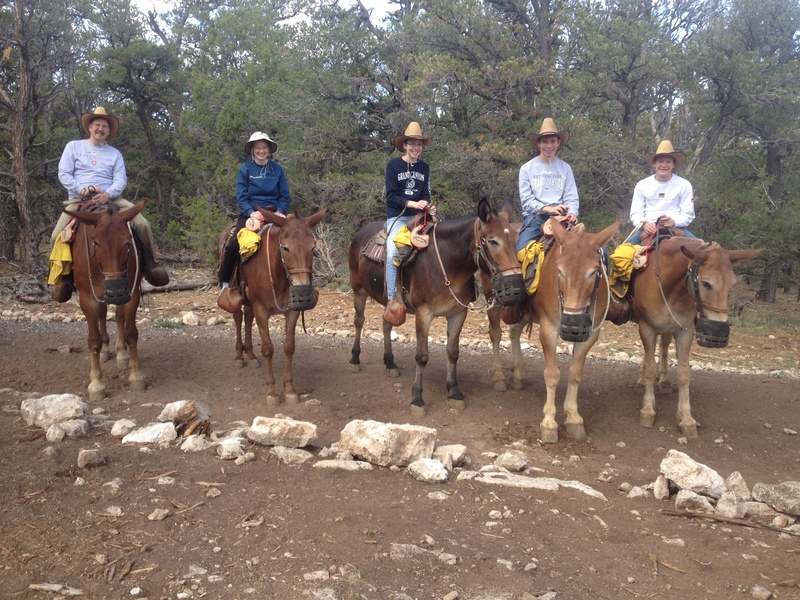 When we arrived, we met our mule guides and learned the basics of riding a mule. I had never rode a mule before then, so I was excited to see what it would be like. I met my mule, Cher, and with help from one of our mule guides, ascended onto her saddle. Cher was a big mule with chocolate-brown hair. She was a good-natured mule, but sometimes when we were riding, she would move her head closer to my brother Patrick than he liked. Our mule guide was named Hoop, and he led us on a trail that stretched along the South Rim of the Grand Canyon for about two miles. We didn’t descend into the canyon, but we were able to see stunning views of peaks and cliffs from the top. My family poses on our mules. When we stopped at the trail’s halfway point, I started to feel light-headed and see blackness. I wasn’t used to the high altitude of the South Rim, as well as the hot, dry air. Hoop helped me down from my mule and made me sit under a tree. He poured cold water on my head, and I drank lots of water myself. I’m very thankful to Hoop, because without him, I would have passed out. I felt better on the way back to the mule stables, but my brother Patrick ran into difficulties of his own. While we were riding along the side of the Grand Canyon, his mule, Norman, went off trail and rode over a bush. Norman then walked right by a tree, and a branch scraped my brother’s arm. My brother only had a small scrape but the sleeve of his shirt had a large tear in it because of the branch. Hoop said Norman’s nickname was “4 by 4,” and now we know what he means. I loved mule riding, but I’d like to take a break before doing it again. Going on a road trip was a great way to get to know my family again after cherubs. I miss my cherub friends, and I hope we can go on a mule riding adventure together some day. Greenhills spirit has had its ups and downs in recent years, ranging from the Class of 2015’s sparse Greek-themed forum decoration day in 2013 to the success of the Battle of the Bands competition during the 2014 Spirit Week. School spirit exists at Greenhills, but is not evident throughout the year because of its concentration in a few events. School spirit arises in Greenhills when it’s given appropriate time and care. One such example is the Upper School annual fall trips. In Sept, different grades traveled to their own location to carry out activities and traditions. The seniors visited Lion’s Bear Lake Camp in Lapeer, Michigan, where they spent two days discussing class history, plans for the school year, and leadership. The senior class advisors and Class Principal, Bruce Zellers, set aside time to work on these activities, which fostered spirit in the grade. Class unity sparked on this trip, causing the Class of 2015 to vote for random advisories, which would place members of the class with people outside of their friend groups. When the class of 2015 voted on the method of choosing advisories a few days earlier, the class was sharply divided on whether to make people chose their advisory or make the creation of advisories random. After 24 hours on a class retreat, this stalemate did not exist and a majority of the class voted to randomize advisories. The Class of 2015 must find ways to keep spirit alive throughout the school year, or homework and a plethora of activities will cause students to forget the progress made over class trips. Spirit week similarly fosters school spirit in a set time. Grades compete in activities including forum decorating contests, obstacle courses, and lunch trivia competitions. Spirit week is a climax for spirit during the school year, as a bounty of competitions distract students from the difficulties of a normal school week. Both spirit week and class trips kindle school spirit, but they cannot keep spirit alive for the whole school year. Greenhills students are busy, and school spirit is not realistically a priority for students who are studying for tests or applying to college. However, spirit is a way to encourage students in their daily endeavors, whether that be playing chess or competing in soccer games. An increase in spirited events will lead to a greater interconnectedness among members of the school, and will allow students to focus on something outside of their individual lives. An easy way to foster school spirit is to attend a sports game. Fans cheering at a game motivate athletes, who dedicate hours of their time to a sport. If all Greenhills students attend one sports game (besides their own sport) every month, school spirit would start to spread out throughout the year. Students can also encourage school unity by attending theater performances and music concerts. School spirit is not dead in Greenhills, but individuals must work to keep it alive in busy times like the long days of mid-March. Students are waiting for you to cheer them on, and your math homework can wait.